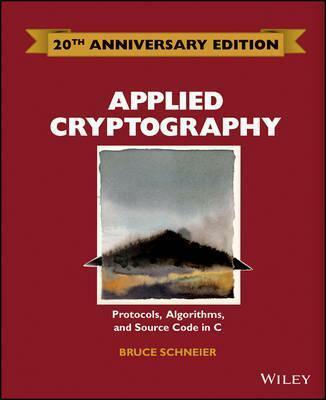 From the world's most renowned security technologist, Bruce Schneier, this 20th Anniversary Edition is the most definitive reference on cryptography ever published and is the seminal work on cryptography. Cryptographic techniques have applications far beyond the obvious uses of encoding and decoding information. For developers who need to know about capabilities, such as digital signatures, that depend on cryptographic techniques, there's no better overview than Applied Cryptography, the definitive book on the subject. Bruce Schneier covers general classes of cryptographic protocols and then specific techniques, detailing the inner workings of real-world cryptographic algorithms including the Data Encryption Standard and RSA public-key cryptosystems. The book includes source-code listings and extensive advice on the practical aspects of cryptography implementation, such as the importance of generating truly random numbers and of keeping keys secure. "...the best introduction to cryptography I've ever seen...The book the National Security Agency wanted never to be published..." -Wired Magazine "...monumental ...fascinating ...comprehensive ...the definitive work on cryptography for computer programmers . .." -Dr. Dobb's Journal "...easily ranks as one of the most authoritative in its field." -PC Magazine The book details how programmers and electronic communications professionals can use cryptography-the technique of enciphering and deciphering messages-to maintain the privacy of computer data. It describes dozens of cryptography algorithms, gives practical advice on how to implement them into cryptographic software, and shows how they can be used to solve security problems. The book shows programmers who design computer applications, networks, and storage systems how they can build security into their software and systems. With a new Introduction by the author, this premium edition will be a keepsake for all those committed to computer and cyber security. This smart, relevant guide is a must for all those committed to computer and cyber security. Bruce Schneier covers general classes of cryptographic protocols and then specific techniques, detailing the inner workings of real-world cryptographic algorithms including the Data Encryption Standard and RSA public-key cryptosystems. This book includes source-code listings and extensive advice on the practical aspects of cryptography implementation, such as the importance of generating truly random numbers and keeping keys secure. It describes dozens of cryptography algorithms, gives practical advice on how to implement them into cryptographic software, and shows how they can be used to solve security problems. "This book should be on the shelf of any computer professional involved in the use or implementation of cryptography." "An encyclopedic survey ... could well have been subtitled 'The Joy of Encrypting' ... a useful addition to the library of any active or would-be security practitioner." ..".the best introduction to cryptography I've ever seen...The book the National Security Agency wanted never to be published..."
..".easily ranks as one of the most authoritative in its field..."
..".monumental...fascinating...comprehensive...the definitive work on cryptography for computer programmers..."
Written by the world's most renowned security technologist this special Anniversary Edition celebrates 20 years for the most definitive reference on cryptography ever published, Applied Cryptography, Protocols, Algorithms, and Source Code in C. Inside security enthusiasts will find a compelling introduction by author Bruce Schneider written specifically for this keepsake edition. CRYPTOGRAPHIC PROTOCOLS. Protocol Building Blocks. Basic Protocols. Intermediate Protocols. Advanced Protocols. Esoteric Protocols. CRYPTOGRAPHIC TECHNIQUES. Key Length. Key Management. Algorithm Types and Modes. Using Algorithms. CRYPTOGRAPHIC ALGORITHMS. Data Encryption Standard (DES). Other Block Ciphers. Other Stream Ciphers and Real Random-Sequence Generators. Public-Key Algorithms. Special Algorithms for Protocols. THE REAL WORLD. Example Implementations. Politics. SOURCE CODE.source Code. References. Bruce Schneier is an internationally renowned security technologist, called a "security guru" by The Economist. He is the author of twelve books including his seminal work, Applied Cryptography: Protocols, Algorithms, and Source Code in C, and Secrets & Lies: Digital Security in a Networked World as well as hundreds of articles, essays, and academic papers. His influential newsletter "Crypto-Gram" and blog "Schneier on Security" are read by over 250,000 people. Schneier is a fellow at the Berkman Center for Internet and Society at Harvard Law School, a program fellow at the New America Foundation's Open Technology Institute, a board member of the Electronic Frontier Foundation, and an Advisory Board member of the Electronic Privacy Information Center. He is also the Chief Technology Officer of Resilient Systems, Inc. You can read his blog, essays, andacademic papers at www.schneier.com. He tweets at @schneierblog.